April in Seattle. The sun is coming out, the flowers and trees are starting to bud and the city parks are bustling with people. You know it’s true spring in Seattle when you see its citizens outside in 50 degree weather in shorts and tees….if you’re not from here, you won’t understand. If you’re visiting us in April, you have so many choices of things to do – even events that are scheduled outside! One of the biggest events of April isn’t exactly in the city, but is definitely worth renting a car for the day: the Skagit Valley Tulip Festival. The Skagit Valley is located roughly 70 miles north of Seattle, about an hour and a half drive during the week. The festival kicks off on April 1st and runs through the end of the month. There is a downloadable guide and driving map on their website, as well as information about the participating farms and other events that go along with it like the street fair in Mt. Vernon and the Parade in LaConner. If pretty flowers aren’t your thing, there’s plenty to see closer to home. How about sports? The Seattle Sounders FC have some really exciting matches this month, hosting Real Salt Lake on the 6th, Toronto FC on the 13th, San Jose on the 24th, and LA FC on the 28th. The Seattle Mariners host the Astros on the 12th – 14th, the Indians the 15th – 17th, the Rangers the 25th – 28th, and end the month with the Cubs on the 30th and May 1st. Foodies love April, specifically Restaurant Week the 7th – 18th. There are over 165 restaurants participating, and they’re offering 3 courses for only $35! There’s also the Scotch & Beer Festival on the 19th and 20th and Argosy offers their Saturday Wine Cruise every weekend. Theater & Arts fans have something to go see every night of the week! Highlights include The Lightning Theif at the 5th Ave Theater, Cats at the Paramount, and the Pacific Northwest Ballet, Seattle Opera, and Seattle Symphony all have full calendars. The Seattle Center has lectures, plays, movies at the Armory and a the Cherry Blossom Festival the 26th – 28th. Earth day is the 22nd, but in Seattle we need 3 days! The 20th – 22nd is Earth Weekend and there are many events, fairs, lectures, and educational events in every neighborhood. And don’t forget Easter! It’s technically Sunday the 21st, but there are events happening all weekend long. The BunnyCon Bar Crawl starts at noon on the 20th, that will be some epic people watching! If you’ll be here with the kids, there are Easter Egg Hunts all over the city, and lots of special Easter menus and bruches at almost every restaurant. Why not try something different this year and check out the Easter Brunch on Blake Island. It includes an amazing buffet, Easter baskets and an egg hunt for the kids and time to check out the beach before you sail home. Click on this link to view the entire 2019 Events Calendar and see what’s going on for your upcoming trip! Events12.com also had a great events calendar that shows fun things to do for the entire Puget Sound Region. 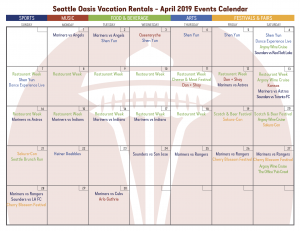 Let Seattle Oasis Vacation Rentals help you find a luxury apartment in the heart of all the April action. From Belltown to Capitol Hill, we have something that will fit your needs. And for those of you who want to get away from it all, we have several quieter units available too. Seattle Oasis Vacation Rentals, Redefining Accommodations since 2007.